CTET 2019 Preparation Tips: The teacher is among the most reputed jobs. For the aspirants looking a career in the education field, it is a profile to establish their feet. CTET (Central Teacher Eligibility Test) is the platform for them which open doors to get this job. The test is organized by the CBSE (Central Board of Secondary Education) twice in a year. Latest Update: Central Board of Secondary Education is going to conduct the CTET 2019 on 07th July 2019. 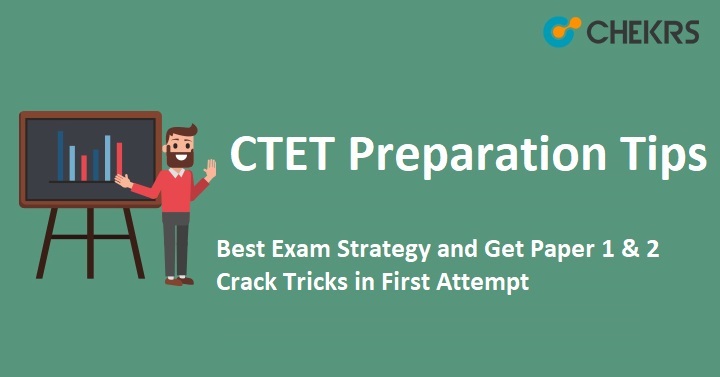 Aspirants can check Preparation Tips for CTET 2019, How To Crack Paper 1 & 2 in the first attempt from here. It is very important for the aspirant to score well for getting placement in leading or a school or their choice. Though the exam is not very difficult following right CTET Exam Preparation Tips are very important to reach the goal. How to crack CTET in the first attempt? Here we have penned down 7 very effective Preparation Tips for CTET to help you get to achieve your goal right very first attempt. Preparation can be organized properly is you know your strengths and weakness. Take a test to know your hand on all subjects. This will help you form a CTET preparation strategy on what, when and how to study. The subjects and marks for both paper 1 and 2 are similar. Hence, if you have prepared good enough for paper 1, you are more than halfway to clear paper 2 as well but How to Crack CTET Paper 1? Mathematics and Child Development and Pedagogy are more time-consuming subjects to cover. Divide your time schedule in a way that all the subjects can be studied but more time can be given to them. For Best CTET Study Material read the NCERT textbooks for best preparation. For the job profile of a teacher, expertise on pedagogy is a must. 60% of questions are framed in such a way from various subjects. While preparing stay focus on these subjects and questions related to it. This can form your 80% of strong base for the exam. This step helps you apply learned methods and approaches in different ways. Practicing as many as possible question help you improve your accuracy level while consuming less time. This helps you know how much effect you have learned a topic and what requires more time. Gives you a rough idea about how much you can expect to score in the main exam. The last days are not for preparation and neither for learning something new. It is the revision time. Go through the topics that you have studied really well. Remember, you can’t remember anything studied at the last time. Don’t panic if you have forgotten something. There is no negative marking in the exam. This can help you score through guessing as well. If you face any sort of query while CTET Exam Preparation then you can ask us immediately, our chekers team will you reply you shortly till then keep visiting our official web page i.e (www.chekrs.com) for more updates regarding Teaching Profession.